Offensive Zone - Scissor with Strong Side Defense | Ice Hockey Systems Inc. This offensive zone system is used when the opponents are being aggressive in the offensive zone. 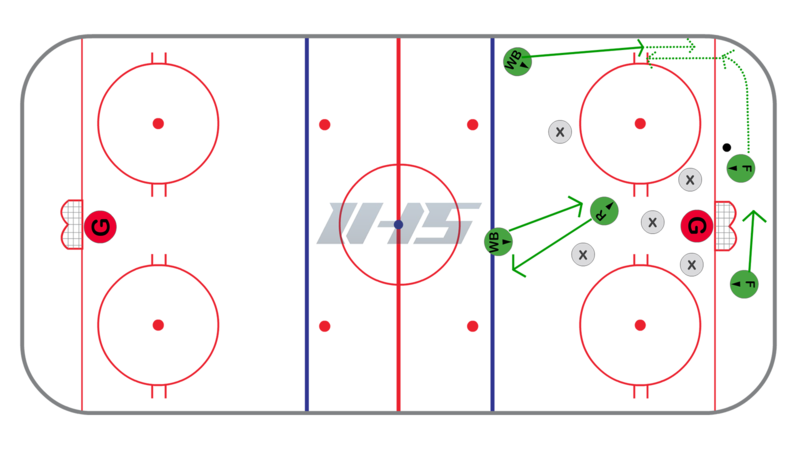 This helps create some space and look to the middle of the ice for quality scoring chances. The forward down low will protect the puck and gain separation from the wall as the strong side defense moves down the wall for support. The player perform a switch and it usually creates confusion with the opponents and allows the puck carrier some time and space down low. They will look to go back up high in the slot for an open player.